Gov. Kim Reynolds ordered flags at half-staff effective immediately and continuing for 30 days to honor former President George H. W. Bush. 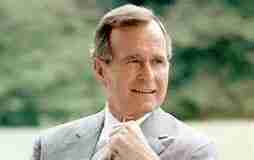 “America lost a great leader with the passing of George HW Bush. A man whose legacy is one of service, statesmanship and values,” Gov. Reynolds said. “Last night, we didn’t just lose a patriot who dedicated his life to serving America, but also a loving husband, father and grandfather who now leaves behind a grieving family.